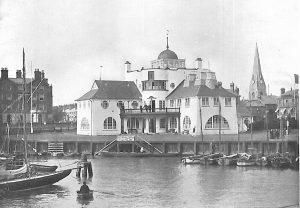 The Royal Norfolk and Suffolk Yacht Club was founded in 1859, having its headquarters at Norwich, and chiefly devoting its funds to the promotion of yacht-racing on the rivers and broads of the district. In 1886 a small club-house was built at Lowestoft, and the club increased considerably in the number of its members. The present club-house was opened in July, 1903, and is considered one of the finest in England. The membership is about 400.